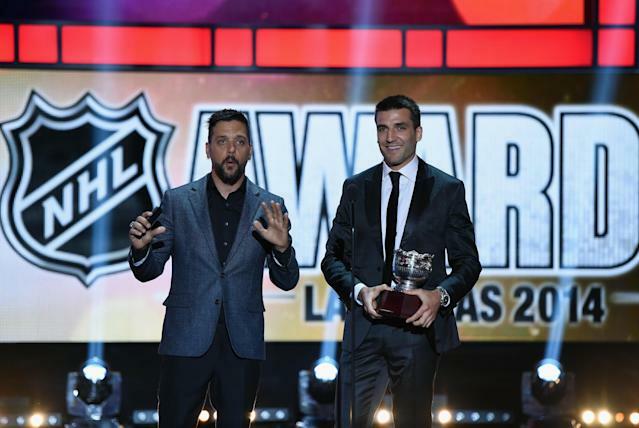 Patrice Bergeron of the Boston Bruins, Anze Kopitar of the Los Angeles Kings and Jonathan Toews of the Chicago Blackhawks are the three finalists for the 2014-15 Frank J. Selke Trophy, which is awarded “to the forward who best excels in the defensive aspects of the game,” the National Hockey League announced on Wednesday. Does that look familiar? It’s because that is basically the exact lead from last year’s post, and it holds true for this year … again. So apparently only three guys deserve this award – which seems to always go to Bergeron except that time Toews won it in 2013. Never mind the fact that there are plenty of other solid options who never have sniffed the award like David Backes. Alas, it’s three players in the three biggest markets again. The award is voted on by the Professional Hockey Writers’ Association and is a bit of an odd trophy. It hasn’t exactly gone to the best “defensive” forward, because if that was the case, someone like Paul Gaustad would at least be a finalist every year of his career. It seems to go to players who, in spite of prodigious offensive talent, use their powers to play a 200-foot game. For example, Chicago’s Marcus Kruger actually plays more time on the penalty kill than Toews. And Bergeron plays about the same amount on the PK as Loui Eriksson, Chris Kelly and Gregory Campbell. But then again, there’s more stock into being a solid defensive 5-on-5 player than penalty killer these days, so who knows. Bergeron was the NHL's top performer in the face-off circle in 2014-15, leading the League in total face-offs (1,951), wins (1,175) and winning percentage (60.2%). He also ranked among the League's top five forwards in a host of statistics that measure team puck possession while on the ice at five-on-five, including SAT (shot attempts differential), SAT Rel% (ratio of player's on-ice SAT vs. off-ice SAT) and SAT Close (SAT in one-goal games in periods 1 and 2, tie games in period 3). Bergeron is a Selke Trophy finalist for the fourth consecutive season; he captured the award in 2012 and 2014 and finished runner-up to Toews in 2013. What, what, what??? The NHL whooping out some fancy stats here? Hello! Bergeron’s advanced stats are pretty solid. Add the fact that those face off numbers are actually important when you’re starting in the defensive zone ... he's much more of a defensive forward than an "all-around" guy, though he did lead the Bruins in scoring this year. Kopitar led Kings forwards in ice time per game (19:23) and was the top face-off man (752-678, 52.6%) on the club that ranked fourth in the NHL in team defense, allowing an average of 2.40 goals per game. He was the NHL's top-ranked forward in the team puck possession metric SAT (shot attempts differential), as the Kings registered 363 more shot attempts than they allowed when Kopitar was on the ice at five-on-five. The 27-year-old center will be vying for multiple honors in Las Vegas, already having been announced as a finalist for the Lady Byng Trophy. Just give it to Kopitar because he is so gentlemanly due to his Lady Byng nod. In all sincerity, in spite of some of his advanced numbers, which are always impressive, he’s had better seasons. Not just from a point total, which has nothing to do with this award supposedly, but part of the reason LA didn’t make the playoffs was a middling 2/3 of the year for him. Toews played a key role in helping the Blackhawks tie for the fewest goals against in the NHL and post the 11th 100-point season in franchise history (fifth since 2008-09). He led all Western Conference players and ranked fifth in the League overall with a career-best +30 rating, ranked fourth in the NHL in face-off wins (947) and sixth in face-off winning percentage (56.5%), and topped Blackhawks forwards in total ice time (1,584:36, 19:33 per game). A Selke finalist for the fourth time in five years, the Blackhawks captain is in quest of a second career win after capturing the award in 2013. Come on, you took out the fancy stats for Toews? Why guys? Why? Toews ranked second on the Blackhawks in shot attempts differential at plus-249 which also was tops amongst Blackhawks forwards. As far as regular stats go, the plus-30 looks nice for a two-way forward. Because really, as part of a voting populous for an award with a nebulous winner trends, it tends to go to the guy who has won it before multiple times as default. Unless this voting populous suddenly decides it’s time to reward Kopitar for being a wonderful all-around player in the year he probably doesn’t deserve the award. Who keeps the metric system down? We do! We do! He. Just. Does. Everything. So. Incredibly. Well. And that has kind of what this award has turned into -- an all-around center award. Though it’s kind of a shame that Ryan Kesler didn’t seem to get any vibe for the Selke for the work he has done in Anaheim. He came in, was told to play as a lock-down defender on the second line and did his job. But shouldn’t this award be given to the best offensive forward since there’s this line of thinking that playing great offense means your defense is better since you're not in the defensive zone as much – looking at you, people who voted Erik Karlsson No. 1 for the Norris Trophy ... the award that's supposed to go to the best all-around defenseman.